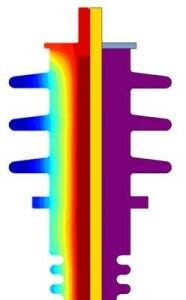 Thermal analysis is required in the design of thousands of products. INTEGRATED provides a 2D/RS program called KELVIN and a 3D simulation program CELSIUS for the analysis of thermal fields. These programs can be coupled with our other electric and magnetic solvers to provide a true multi-physics simulation.